This is about managing perceptions during meetings. This process starts in your head. You don’t have to dominate the conversation, or be in charge, to change how people perceive you at work. Owning any room starts with your mindset, not with your mouth. TED Talks and Youtube have changed business communication forever. It’s a lot less formal now and there are a lot fewer secrets at the top. You still need clarity and some compassion may help, but the killer communication app is personal connection. And … brevity is boss. But the quality it takes to own the room runs even deeper. Open workspaces favor the chatterers… but quiet people [aka introverted executives] can rule where it counts – the conference room or the meeting space. Owning the conference room means Decision Makers and others notice you and your ideas. And better yet, you stop identifying with your inner psychopath as people drone on off topic. You can reel them back, if you choose to. By managing perceptions, people treat you differently without your saying a word. It’s like having an invisible publicity agent who promotes you silently. The One Thing You Need to own that room, before you walk into it, is this. You have got to know what you want out of the meeting or your goal. Taking the time to get clear is your winning ticket. A person with a purpose is unstoppable. This is not about the official agenda; it’s your personal agenda for the meeting or presentation. One objective that matters to you. Be abundantly clear. Even if it’s a routine meeting, you go in knowing your end game, which may or may not have anything to do with the official agenda. The fact that you are now clear on what you want out of the meeting comes across to others as Nobel Prize-winner confidence. When you do speak, people listen. With your mind decided upon on your goal, you can let go of other expectations … and relax! Now maybe you find out what you came in for during the first five minutes of the meeting. Leave then, if you can. If you can’t, refer to the below list of 5 mindset reminders. Use the time to think about your week-end plans, or decide on someone you want to get to know better. You could also possibly learn something useful from the chatter. You’ll never get far trying to be all things to all people. To be more successful at work, be more of you. To empower others, show them their value. Stay unreasonable, even when you ruffle people’s feathers. The more you leverage your strengths and personality traits, the more you stand out…in a good way. Know what you want out of the meeting. Keep your mind trained on useful thinking. This is what it takes to own the conference room. 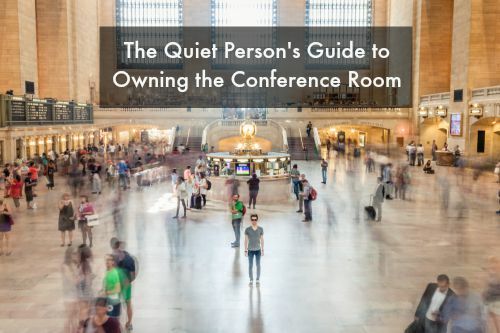 Next week you’ll learn 8 more tips you can use to Own that Conference Room. Until then, be clear, work hard and the rest will come. Laura Mixon Camacho, PhD, is obsessed with communication as a tool for building bridges and careers. She believes all conversations should be carried out with style and enthusiasm. And a presentation is just a special sort of conversation. Laura facilitates interactive, fun communication workshops and she does executive coaching. She is the go-to coach if you want to improve your communication skills so that you can move your business or career forward with more confidence, more impact and less stress.